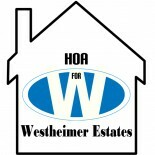 Importantat Numbers | Homeowners Association for Westheimer Estates, Inc. Please let us know if you do not see a number you think should be on this page. We will update our list as soon as possible after receiving your request.